A client contacted me who had some old gold rings that she never wore and she also had a troy ounce gold ingot that was kept in her jewellery box. She wanted two rings made from the gold that fitted with her current engagement ring, one as a wedding band and one as an eternity ring. Normally when I make commissions or other jewellery I buy in the materials and make the pieces from these. So this was a new challenge as I had not melted down gold before, never alone seen a real gold ingot so this was really exciting! The rings themselves were a combination of 9ct and 18ct and the ingot was 999. As I had never worked with 999 before I wanted to use the ingot to make these rings and to get it hallmarked at the highest standard rather than mixing the golds together. The diamonds from the rings were also to be used and set into the new rings. I decided to make silver sample rings before going ahead and making them in the gold, the ring in the centre is the clients own ring. I made one v shaped and the other curving round the engagement ring to create a different look. In the end we thought that the V shaped rings either side would be best. One of the rings would be thicker to fit the 3 larger diamonds and the other ring was to be thinner with the two tiny diamonds and the 2mm diamond taken out of my clients old rings and reused. The process of melting the ingot proved to be difficult and time consuming, but was a great learning curve. I purchased a skillet to melt the gold into and cut the ingot into strips and laid them into the skillet. Unfortunately the skillet obtained most of the heat and my blowtorch couldn’t make the gold melt. So I tried laying the gold strips onto my honeycomb blocks and melted the strips together which worked! Then by using my drawbench I drew the gold down into square wire and used my rolling mill to flatten the metal. 999 carat gold is such a soft metal to work with. It files, sands and forms very easily so it was very nice to work with but you have to be very gentle with it. The next stage was to create the V shape, form the ring and solder. I did this process twice but made one of the rings thinner than the other as the smaller diamonds were to be set into this ring. 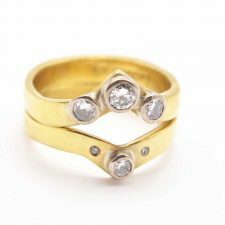 When wearing all rings together it would have been really chunky if both rings were the same thickness so I thought it would be best to make one thinner and the diamonds wouldn’t be lost with a thinner shank. Next I smoothed the edges by filing and sanding with soft grade files and paper. Then soldered the 18ct white gold tubing onto the rings, cleaned, polished and then finally set the stones. It was a great experience making these rings and I learned a lot from it. So if you have any gold jewellery that you no longer wear which is sentimental to you. Instead of leaving it in your jewellery box come to me to get it made into something that you can enjoy wearing again.